A generation that’s coming of age during this ugly election is rejecting Trumpism in a big way. In late September and early October, as Hillary Clinton was pulling ahead to a six-point lead over Donald Trump, a handful of polls were released that ostensibly found that millennial voters lack enthusiasm for her candidacy. Fewer said they were likely to vote this year than in the past couple of elections, and many more of those who did plan to vote told pollsters that they’d support a third-party candidate this year than in past cycles. Among young people who say they’ll vote for a major-party candidate, Hillary Clinton is crushing Donald Trump. In some polls, she leads among millennials by a larger margin than they favored Barack Obama over Mitt Romney in 2012. 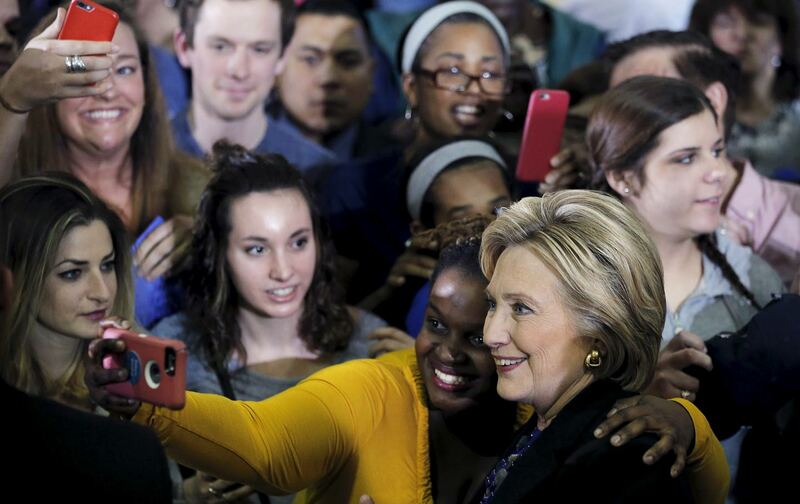 Clinton's "millennial problem" is based entirely on comparisons with young voters’ enthusiasm for Barack Obama. Polling backs up this view: According to a widely cited survey of young voters conducted by Harvard University’s Institute of Politics, voters aged 18 to 29 may be less enthusiastic about voting this year, but 49 percent of them say they’re certain to go to the polls, which would result in a turnout rate just one percentage point lower than in 2012 and three points lower than in 2008. And that would still be a higher rate of turnout among young voters than in the 1996, 2000, and 2004 election cycles. There’s a growing body of data showing that partisan allegiance has only a tenuous relationship with the parties’ policies or ideology. Most voters don’t hold consistently liberal or conservative world views and have only limited knowledge of public policy. Most voters’ affinity for a party results from a mishmash of inherited partisanship, symbolic attachments, and social identity. And a key influence on one’s partisan preferences is the era in which one becomes politically aware. As their most visible representative, presidents always influence their parties’ popularity and reputation. Whether they are perceived as successes or failures appears to have an especially strong influence on those whose political identities are just forming. People who turned twenty during Bill Clinton’s presidency skewed somewhat Democratic, and the party gained a pronounced advantage among those who came of age under an extremely unpopular George W. Bush. That trend only grew under Obama, who has consistently been more popular among younger people than the population as a whole. “I don’t think their attachment to the Democratic Party is based on their left tilt relative to the Republicans,” says Jacobson. “I think it has much more to do with cultural identity.” Much of this generational shift toward Democrats reflects larger demographic changes—each cohort has been less white than the one that preceded it. “Which party is for people who look like them? Which party is for people who hold their beliefs about tolerance for diversity, familiarity with diversity? They see one party of mostly older white people, and another party full of people who look somewhat like them and share similar life experiences, and that’s the party where they feel comfortable,” says Jacobson. Democrats hold a significant advantage among voters who turned 20 this year. And while young people are the most likely to identify as independents, most lean toward one party or another—there are fewer genuine swing voters among the cohort that came to age under Obama than there are among slightly older voters. With Donald Trump as the GOP standard-bearer, the 2016 election will mark almost a quarter of a century of young people gravitating toward the Democratic Party; If Clinton is elected and the economy continues to rebound under the first woman president, we could see that period stretch out to almost 40 years. And Jacobson thinks that, over time, this trend could lead to less nastiness in our politics. He notes that young people who came of age during Obama’s presidency are notably less polarized than earlier generations, in large part because young Republicans are “less likely to consume conservative media and to share the beliefs common among their audiences: compared with older Republicans, those under 30 are significantly less likely to watch Fox News and other conservative outlets, to believe Obama is foreign-born or a Muslim, and to deny that human activity is heating up the planet. They are also less sympathetic to the Tea Party movement.” Polls show Clinton running neck-and-neck with Trump among all white voters, but an Ipsos poll released this week found her ahead by 30 points with whites aged 18 to 34. Demography isn’t destiny, and generational loyalties can be upset by shocks like a major scandal or a deep recession. But with the Republican Party trapped between a changing electorate and a base that’s embraced a white ethnic nationalist as its nominee, the “Trump effect” could have a significant long-term impact on our politics.